I’ve started a new podcast project, telling the stories of how a generation of men and women writers survived the Great Depression. You can find the Sad Men Podcast for free at iTunes and at SoundCloud. My first episode ponders the bloody legacy of the great horror radio writer, Arch Oboler. It is a companion piece to my Los Angeles Review of Books essay about the history of scary radio and podcasts. Podcast image: “High Straw Hat” by Ernest A. Towers, Jr. 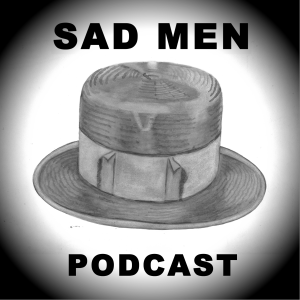 I am author and journalist Jason Boog and this is the Sad Men podcast. I will tell you stories about how a crew of misfits, failures and forgotten writers survived the Great Depression. This scrappy generation has been wiped off the literary map and long forgotten. But we need to remember them now more than ever. That was the voice of Arch Oboler, the legendary radio writer who hit the Chicago radio scene in 1933, half starved by the great depression and hell-bent on writing radio dramas. Oboler plucked his monsters from the anxious collective unconscious of a country clawing its way out of the Great Depression. An entire generation had been choked by poverty and uncertainty, and everybody knew what it felt like to be buried alive in the barren ground of our busted country. That episode generated 50,000 letters from shocked listeners and Oboler went on to craft more than 100 scary radio plays. Two years into his bloody reign on Lights Out, Oboler wrote “Murder Castle,” the story of an impoverished girl who begs for work at a rich man’s mansion. The sadistic owner kills her and buries her in cement, one of many poverty-stricken victims. Later, the murdered girl’s sister returns to the murder castle and kills the serial killer—we hear him die, screaming in agony. But the heroine is driven insane by her cold-blooded deed, and ends the episode by chanting revenge revenge revenge over and over again. The story was based on the 19th century serial killer named H.H. Holmes, a man hung for murdering countless women in Chicago. Oboler’s version of the story haunted a generation that had been scattered by the migrant economy of the Great Depression, a world that split families and sent lonesome travelers chasing the promise of work far far from home. Oboler mined Great Depression anxiety, fears and desperation for his celebrated Lights Out run, condensing a decade of tears and bad memories into invisible, imaginary creatures that crouched behind radio receivers late at night, crawling out during the dark hours when people remembered all the bad things that they had seen and done during those miserable years. In his final episode of Lights Out, Oboler wrote a story about a character named “Arch Oboler.” His fictional alter ego struggled to write a Lights Out episode, despite a tight deadline. While writing, this fictional version of Arch Oboler reads an ancient book of curses out loud for inspiration—accidentally summoning a shambling hell beast that is invisible to everyone except Arch Oboler. Over the course of the bloody episode, the mumbling moaning and groaning monster brutally murders his family and friends—but no one can see this hell-spawned Mister Snuffleupagus except for Arch Oboler. In a final twist, we discover that the whole episode was just a dream, a nightmare concocted for Arch Oboler’s final Light’s Out episode. But suddenly, our illusion of safety shatters when the imaginary monster growls in the corner, devouring our hero while the real Arch Oboler screams and screams. After scaring his listeners with nightmares painfully close to real life, Arch Oboler’s greatest horror story came to life and murdered its master—literally killing his radio show. This entry was posted in Sad Men.